Located on the shores of the serene Lake George, in the heart of the Adirondack Mountains, The Inn at Erlowest exude the elegance and charm of a bygone era. Surrounded by pristine natural beauty and fresh mountain air, The Inn at Erlowest has been transformed from what was once a private residence into a luxurious Inn and farm to table restaurant. Set within a magnificent turn-of-the-century Queen-Anne stone castle, the Inn boasts luxurious suite-only lodgings with period décor and furnishings, spacious sitting areas with woodburning fireplaces, private bathrooms with Jacuzzi tubs, and deluxe amenities. The Inn at Erlowest features ten exquisitely appointed guest suites with period décor and antique furnishings. Luxury suites feature gleaming parquet floors, king-size beds with pillowtop mattresses, Egyptian cotton linens, and down comforters and pillows, and en-suite bathrooms with antique bathtubs or walk-in showers, Jacuzzi tubs, Anichini towels, spa bathrobes, and deluxe Penhaligon bath products. Spacious sitting areas feature plush sofas and armchairs, oriental carpets, ornate wood-burning fireplaces and modern amenities such as air conditioning, heating, and flat-screen televisions with DVD players. Other in-room amenities include hairdryers, in-room safes, mini-fridges, irons and ironing boards, beach towels, telephones, and complimentary wireless Internet. All guest suites are located on the second floor of the Inn and have large windows overlooking the beautifully manicured English country-style gardens. The Inn at Erlowest boasts a long legacy of culinary excellence with an intimate, award-winning Four Diamond restaurant that is open for dinner every evening. Executive Chef, Adam Padilla, creates a seasonal menu of contemporary cuisine prepared with fresh, locally sourced ingredients and paired with an extensive list of imported wines from around the world. Guests are treated to a gourmet breakfast served in the dining room every morning, which includes fresh fruit and fruit juices, homemade granola, cereals, and yogurt, egg dishes and hot entrées, freshly baked bread and other delights, along with freshly brewed coffee and tea. Amenities at The Inn at Erlowest include a complimentary gourmet breakfast served every morning and dinner at the Inn’s award-winning restaurant (served seasonally). A cozy library bar and a patio and patio with a fireplace and breathtaking view of Lake George is the ideal place for relaxing with drinks and socializing with other guests, and the beautiful location on the shores of Lake George offers a spectacular setting for romantic weddings and special celebrations, as well as an array of activities such as hiking, horseback riding, mountain biking and fishing. The magnificent setting of the Inn’s turn-of-the-century Queen-Anne stone castle and magnificent gardens and grounds offer a beautiful and romantic venue for weddings, elopements, and special celebrations. 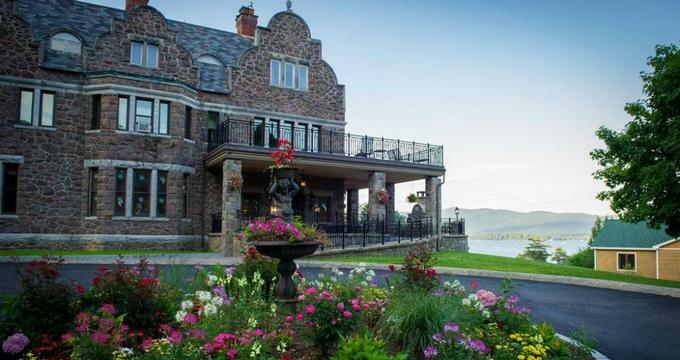 Exuding a rich history, The Inn at Erlowest is a premier event facility with elegant indoor and outdoor venues with breathtaking views of Lake George, luxury amenities, and unparalleled guest services. On-site ceremony locations include the shores of the Lake George, the North Pointe, and the Courtyard with beautiful lake views. Indoor venues include the Grand Ballroom which can accommodate up to 250 guests and features an outdoor front terrace for cocktail receptions. Guest services include a professional event manager to ensure the event runs smoothly, catering services with award-winning cuisine, floral arrangements, décor and tableware, audiovisual equipment and sound systems, and entertainment.